This month, out of the 26 Martyrs of Nagasaki, whose feast day is on Wednesday, February 6, I would like to single out one of the martyrs, a saint that I think deserves to be known. Fr. Pedro Bautista y Blasquez was outside Avila, Spain. Avila, as you probably have heard produced a few saints - St. Teresa of Avila, St. John of the Cross and this man, St. Peter Baptist (will be known as Pedro Bautista, OFM). Pedro Bautista joined the Order of Friars Minor or Franciscans. At the age of 40, he was already a renowned orator from the pulpit of the Cathedral in Toledo, Spain. He also taught Philosophy and was an avid musician. Pedro Bautista, OFM was part of the fourth group of Franciscan missionaries who arrived in the newly colonized islands of the Philippines. Upon his arrival, he made sure that the Franciscans already established the Custody (prior to becoming a Franciscan Province) in the islands. His first assignment was to a town outside Manila (Manila was then located within the walls of Intramuros). He was to teach the children and adults music and sing chants for mass. After a year of doing that, in 1586 he was elected to be the Superior of Franciscans in the Philippines. Being a humble man, he begged not to be elected to such post but was convinced that he was the only man for the job. With that in mind, he went ahead and performed his role to the best of his ability. He animated his religious brothers to live out their profession and to take care of the conversions of the people of the land. He founded numerous towns and build numerous stone churches, of which he is the first to build such outside of Manila. He wrote letters to the King of Spain and to the Pope asking for more missionaries in the Philippines. He spoke at the pulpit of Manila Cathedral and in the streets of Manila "Does anyone want to be a soldier of this band? The Captain is Christ. The Lieutenant is St. Francis (of Assisi). The War is Hell and the wages - Glory." Those fiery words aroused the spirits of the men and soldiers in Manila and invited them to join the religious life. Even the Governor General was amazed at his eloquence when someone in his own household joined the Franciscans and became the first Chronicler of the Order. Pedro Bautista, OFM even defended the native settlers from the Archbishop's request to collect tributes from the natives. They said that it is not right to collect from the natives for the full amount that they do not have, and that the tributes should come from the wealthy. He advocated for justice, charity and freedom for the innocent. In 1590, he found that Manila was getting a little too crowded and looked for a place of solitude and rest. That is when he was given 250 hectares of forest land outside Manila. This place was and is currently known as San Francisco del Monte (the town JP grew up at). He built a bamboo chapel and a place to retire and find solitude with the Creator of all that is Good. He also founded the springs of Los Baños to be beneficial to the health of people as well. The Emperor of Japan has threatened to invade the Philippine Islands. So the Governor General needed an ambassador that he can trust to make peace with the Emperor. He sent Pedro Bautista, OFM as his ambassador. The first ambassador died at sea during a thunderstorm. So Pedro Bautista went to Japan to intercede for the Spanish Crown and the natives of the islands. He was successful. As he was already there, he thought of spreading out Christianity in the Land of the Rising Sun (Japan). A few years later, the local High Priests became jealous of the Christians as it was spreading throughout the land like wild fire. So, they advised the Emperor of the things that were going on throughout the land and how the Christians were taking away from his High Priests the people that used to pay him tribute. Out of anger and rage, he had all the Christian leaders thrown into jail. Pedro Bautista, OFM led this small group of Christians. They were to process through key cities and were to be crucified in Nagasaki. At the beginning of their "way to the cross", their ears were cut off. At key cities that they stayed, Christians lined up and wept as they saw them and their fellow Japanese counterparts in the procession of shame. The martyrs along the way consoled their mourners and asked them to continue praying for strength to carry on with life. Note that among the 26 martyrs, 3 were teen agers (13-15). They were martyred by fixing them each to a cross (each cross had their names on them and was created for their size) on February 5, 1597. 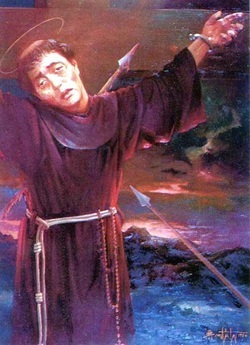 Pedro Bautista, OFM led the singing of "Te Deum" as one by one the martyrs would be pierced with a lance on both sides crossing their hearts. Many Japanese and Europeans witnessed the last moments of these brave men. Pedro Bautista was the last to be pierced. This man, not so much well known in the world today, was a priest, prophet, an ally of the foreigners (the natives), fought for justice, fought for freedom, fought for charity, founded towns and churches, found refuge in the solitude of mother nature and found courage and strength in others through prayers and his firm faith in the Almighty. Pedro Bautista changed our lives. He contributed to local history and that of the church. How many people can say that they know of such a man who has lived in 3 countries and has touched the lives of many then and even now 400+ years later? Now, what can you do today that can be remembered about you after your earthly life?